Men of Letters: Harold jumps at the chance of supplying an article for the parish magazine on the history of the rag and bone trade in Shepherd's Bush. Could it be the start of a wonderful new career. A Star is Born: Albert and Harold are both offered parts in the local amateur dramatic society's latest production, but who will upstage whom? Only the opening night will tell. Oh What a Beautiful Mourning: The death of Albert's tight-fist..
From Galton and Simpson (the award winning writers of Hancock's Half Hour) come two movie spin-offs of the classic TV Series, Steptoe And Son, charting the love-hate relationship of a widower father Albert (Wilfrid Brambell) and his unmarried son Harold (Harry H. Corbett) who together run a decrepit rag-and-bone business in London. Steptoe And Son: In Steptoe And Son, Albert and Harold live amicably together at the junk yard until Haro..
Own Steptoe & Son Series 1 to 8 Complete Collection DVD from Deff, DVD, Blu-Ray & 4K Video Specialists - Free UK Delivery..
Upstairs, Downstairs, Upstairs, Downstairs: Albert's upstairs, flat on his back. Soothed by Harold's filial care and attention, not to mention the TV, liqueur chocolates, grapes and unlimited beer, his slipped disc is healing very slowly. Meanwhile Harold is out on the round - until he notices the mysterious disappearance of all the pink liquorice allsorts downstairs... The Bath: What a way to live! Harold's invited a "bird" for cockta..
Own Steptoe and Son DVD from Deff, DVD, Blu-Ray & 4K Video Specialists - Free UK Delivery..
Own Steptoe & Son Series 2 DVD from Deff, DVD, Blu-Ray & 4K Video Specialists - Free UK Delivery..
Own Steptoe & Son Series 3 DVD from Deff, DVD, Blu-Ray & 4K Video Specialists - Free UK Delivery.. These episodes from series four of the classic comedy were broadcast in October and November 1965. Though still incredibly popular, the team decided this would be the final series. They would not change their mind until 1970 - making these the last episodes to be recorded in black and white. And Afterwards At...: "This should be the happiest day of my life and it could be if you weren't pouring out your satanic little thoughts." Harol..
Own Steptoe & Son Series 5 DVD from Deff, DVD, Blu-Ray & 4K Video Specialists - Free UK Delivery.. 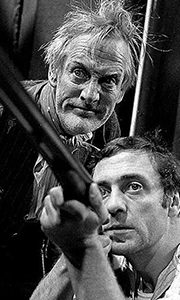 The eighth series of Steptoe and Son was its last, the 1974 Christmas special that followed it becoming the 57th and final episode. The series that had changed the face of British comedy remained as hilarious and poignant to the end including such memorable moments as Harold discovering just what the butler saw; Albert eating pickled onions in the bath and the fabulous waterbed affair. Episodes: Back In Fashion: When the Steptoe yard ..
Any fears that Ray Galton and Alan Simpson might have had of their seminal comedy series losing its impact with the advent of colour television (although only two colour episodes survived), were well and truly dispelled by the time this series went out in the closing months of 1970. The series was more popular than ever and the writing reached new heights as evidenced here in classic episodes like Come Dancing and Tea for Two. Robbery W..